When I first started using small sized mating nucs the scoop of choice was a type of flimsy plastic cup that was, and still is, used in vending machines (extreme right) these had a rolled rim (inset) that stiffened the thin plastic material and made scooping the whetted bees more easy. A note I should make here is that the bees are whetted for lubrication purposes and reduction of damage to the bees themselves, not in order to stop flying bees from escaping. You should allow those bees which will fly readily to do so and escape capture as we are more interested in the younger bees that will be less likely to take flight. 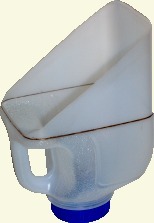 UK milk supplies come in plastic containers that usually have a handle as part of their shape, the body of the container can be readily cut to produce an easy to use scoop that can be used to measure out quantities of honey bees for transfer to mating nucs or for gathering quantities of bees to be used in diagnostic tests. The plastic containers can be of many sizes in both metric and Imperial volumes, but they are easily cut and several slightly different scoops can be made from similar sized containers. The cap is useful as it can be used to jar the bees down into the scoop by rapping it smartly on a hard surface, I make the cap secure by running a bead of jet melt glue around the mouth of the screw thread on the bottle portion, then re-melting this glue using a hot air gun (paint stripper) and quickly screwing the cap in place. Not only does this secure the cap, but the glue stiffens up the assembly and renders it less likely to damage from the jarring to compact the bees. The one pint size container can be cut as indicated in the image at right, although the original volume was 568 ml, by the time it is cut it only holds 230 ml of bees up to the line marked around the shoulder on the finished version. (photos not to same scale) If you require 300 ml for your type of mating nuc (I believe that is recommended for Apidea nucs) you can cut the taper on the scoop at a steeper angle to encompass more bees at the scooping stage, with a line marked at the 300 ml level (one that is cut and marked in this fashion is illustrated below right). Although it's measured volume is much larger... When the scoop is in use, it does not get filled to maximum capacity. The actual volume of bees only becomes apparent once the bees are consolidated by the rapping of the cap on a suitable hard surface. If required a narrow strip of adhesive tape or mark made by felt tip pen can be applied to the outside of the scoop to indicate a precise volumetric measurement. 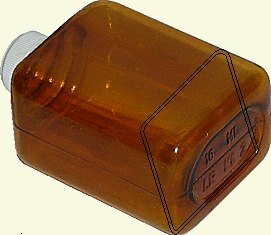 The Cola bottle version shown here may not have a flat bottom, but it is quite flexible and only mild pressure will distort it so that a reasonable portion of the lip is in flat contact with the box while sliding the scoop along to collect bees. The 300 ml line was marked using water and a photographic measuring cylinder. The two pint container is more useful than the one pint, the handle is larger which renders the gripping of the scoop more easy. The container itself is taller and can be cut at several different places along it's length in order that specific volumes can be accommodated. The red lines in the image at right show several alternative cutting possibilities. Another useful feature of the two pint type is that the body is almost square, this allows an extra type of scoop to be made that has its mouth cut obliquely from corner to corner. Such a scoop can be used when there are only a few bees left in the collecting box as they can be bumped into the angle between the base and one of the walls and the scoop run along both faces. As the handle is in the middle of one face, you need to consider whether you are right or left handed, when you mark out your oblique cutting. The one shown at right has been cut for left handed use, the tip can have the rounded profile sharpened up by simply pinching between thumb and forefinger. 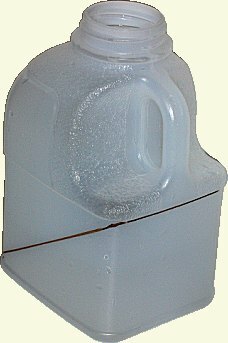 The four pint container may be more appropriate for filling larger nucs, but it is flimsy and wobbly compared to the two pint one, it also has less opportunity for creating different volumes. When I made my first sample of this type I found that the lip that is used to collect the bees would buckle under very little load and so I made several others from milk containers that were purchased from different outlets. Even though some designs were different they all exhibited this flimsy collection lip, so I would recommend that unless you can find more robust cartons than I did, you should use two scoops full from a two pint scoop rather than risk the damage to bees that occurs with the buckling lip of the four pint type. I should add that on the one pint and two pint types I made the lip from the very slightly curved portion that exists near the base of the container, this both stiffened the lip and allows it to slide easily in good contact with the base of the box, eliminating damage to the bees. This curved bottom lip also allows the scoop to be run at a slightly elevated angle, which makes life easier. The finished scoops are not very durable, but the cost of replacement is nil and as they are very easily and quickly cut using a craft knife or scalpel, they are little trouble to make. The ones in my photographs were made purely for the photographic session and only took a few seconds to make. 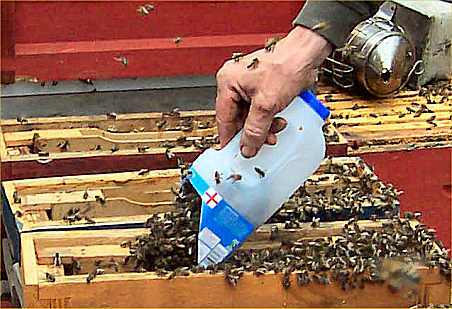 The photo at right by Sandra Unwin, shows Michael Collier using one to fill three frame mating nucs that are based on full sized National frames, in his case the label on the container was of the self adhesive type and was left in place to help the stiffness of the mouth of the scoop. Michael Collier is a commercial beekeeper who runs Cornbrook Bee Farm, every two years he holds an open day, where all aspects and stages of queen rearing are discussed and demonstrated, I had the pleasure of attending in 2007 and am already looking forward to the next one ! 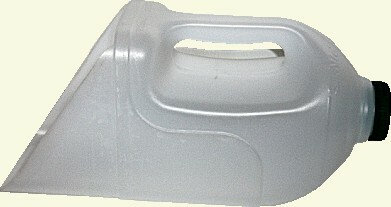 The items shown are not exhaustive, the principle can be extended to other types of plastic container. If your purpose is small samples of bees then there is some mileage to be had from devices that are adapted from medicine containers or the larger type of plastic pill bottle. I have indicated at right how a large tablet bottle can be cut for bee sampling, you will need to experiment according to what container you have and what quantities of bees are needed for your morphometric or disease analysis, but the principle is similar to that for larger bee volumes. the sharp edge that results in cutting by hacksaw can be rounded off using a fine file so that the collecting edge rides smoothly over the base of the container that the sample it taken from (this reduces damage to bees that may later be measured or inspected under a microscope).